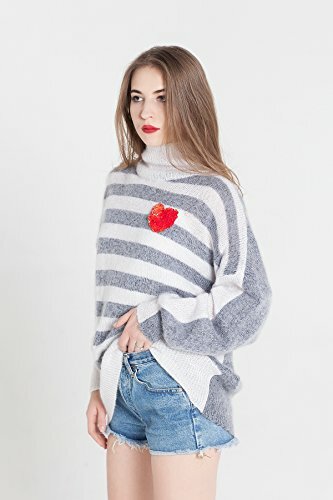 If you can't decide whether you need a gray knitted sweater or a white knitted sweater - here is an ideal striped mohair designer knitwear item to be your beloved 2in1 solution - gray and white sweater! This gray pullover is also a white pullover at the same time - we'll never decide whether the glass is half empty or half full, but we know it is a stylish designer clothing item to wear for a stunning casual look. Only top quality yarn had been selected for creation of this item: Goat down (baby mohair) 55%, silk 35%, polyamide 10%, sequin embroidery The mix of yarn may vary for your item due to availability at the time of the order - we will knit it from high quality yarn only. ❤️ CARE INSTRUCTIONS: Delicate Handwash only at 30C max. No bleaching. Delicate loundry detergents recommended. (for wool, silk, cashmere, hand-wash) No tumble dry. Do not squeeze after washing. Lay flat to dry. Delicate Dry Cleaning for wool items is allowed. If you have any questions about this product by Esh by esh, contact us by completing and submitting the form below. If you are looking for a specif part number, please include it with your message.